Groups of Soldiers after their paragliding descent of 2,033 meters. 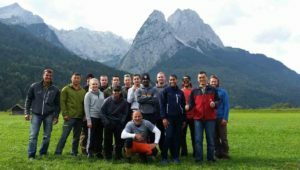 Twelve Soldiers from the Garmisch Community, Marshall Center and NATO School in Oberammergau enjoyed a breath-taking paragliding flight over Garmisch-Partenkirchen on Sept. 23. Photo by Maj. Eun Kim, USAG Bavaria Garmisch Chaplain. GARMISCH, Germany — Twelve Soldiers from the Garmisch Community, Marshall Center and NATO School in Oberammergau enjoyed a breath-taking paragliding flight over Garmisch-Partenkirchen on Sept. 23. In conjunction with September’s Suicide Awareness Month, a group of Soldiers conducted a resiliency training hosted by Chaplain (Maj.) Eun Kim, Garmisch Community Chaplain. The focus of the training day was pinned on “Personal Courage,” one of the seven Army Values. The group made a great effort to develop emotional and spiritual dimensions of strength, stepping out of their comfort zone and leaving solid ground behind. They took off from a mountain pasture — around 2,033 meters — just below the Alpspitze in Garmisch-Partenkirchen. The group met at the Garmisch Chapel and, after a short drive and meeting with the four instructors, took the Alpspitzbahn, or cable car, up the mountain. The flight could be anywhere from four to seven minutes, depending on the number of stunts. The group loved it. Soldiers learned how to overcome fear, danger or adversity by taking the adventurous paragliding flight over the majestic mountains of Garmisch. The training created a very unique, once-in-a-lifetime experience that helped cultivate the capacity for Soldiers to overcome challenges in their military lives.